The Reserve Bank of India (RBI) is India’s central banking institution, which controls the monetary policy of the Indian rupee. It commenced its operations on 1 April 1935 during the British Rule in accordance with the provisions of the Reserve Bank of India Act, 1934. The original share capital was divided into shares of 100 each fully paid, which were initially owned entirely by private shareholders. Following India’s independence on 15 August 1947, the RBI was nationalised on 1 January 1949. Monetary Authority: Formulates, implements and monitors the monetary policy for A) maintaining price stability, keeping inflation in check ; B) ensuring adequate flow of credit to productive sectors. Regulator and supervisor of the financial system: lays out parameters of banking operations within which the country”s banking and financial system functions for- A) maintaining public confidence in the system, B) protecting depositors’ interest ; C) providing cost-effective banking services to the general public. Regulator and supervisor of the payment systems: A) Authorises setting up of payment systems; B) Lays down standards for working of the payment system; C)lays down policies for encouraging the movement from paper-based payment systems to electronic modes of payments. D) Setting up of the regulatory framework of newer payment methods. E) Enhancement of customer convenience in payment systems. F) Improving security and efficiency in modes of payment. Manager of Foreign Exchange: RBI manages forex under the FEMA- Foreign Exchange Management Act, 1999. in order to A) facilitate external trade and payment B) promote development of foreign exchange market in India. Issuer of currency: RBI issues and exchanges currency as well as destroys currency & coins not fit for circulation to ensure that the public has adequate quantity of supplies of currency notes and in good quality. Developmental role : RBI performs a wide range of promotional functions to support national objectives. Under this it setup institutions like NABARD, IDBI, SIDBI, NHB, etc. Banker to banks: An important role and function of RBI is to maintain the banking accounts of all scheduled banks and acts as banker of last resort. Agent of Government of India in the IMF. One of the most important functions of RBI is to work as regulator and supervisor of financial system. The financial system in India includes Commercial Banks, Regional Rural Banks, Local Area Banks, Cooperative Banks, Financial Institutions including Development Financial Institutions (DFIs) and Non-Banking Financial Companies. RBI derives its regulating powers for Indian Banking System from the provisions of the Banking Regulation Act 1949. For other entities, it derives power from the RBI act 1934. The objectives of this function are to protect the interest of the depositors and maintain the safety and soundness of the banking and Financial System of the country. Licensing Requirements: To do a business of commercial banking in India, whether it is India or Foreign, a license from RBI is required. Opening of Branches is handled by the Branch Authorization Policy. Ensuring Corporate Governance in Banks: One of the policy objectives of RBI is to ensure high-quality corporate governance in banks. RBI has issued guidelines for ‘fit and proper’ criteria for director of banks. RBI can also appoint additional directors to the board of a banking company. Statutory Checks/Compliances: Each commercial bank is required to maintain certain portion of their Net Demand and Time Liabilities (NDTL) in the form of cash with the Reserve Bank, called Cash Reserve Ratio (CRR) and in the form of investment in approved securities, called Statutory Liquidity Ratio (SLR). Interest Rates: The interest rates on most of the categories of deposits and lending transactions have been deregulated and are largely determined by banks. Reserve Bank regulates the interest rates on savings bank accounts and deposits of non-resident Indians (NRI), small loans up to rupees two lakh, export credits and a few other categories of advances. Prudential Norms: Prudential Norms refers to ideal / responsible norms maintained by the banks. RBI issues “Prudential Norms” to be followed by the commercial banks to strengthen the balance sheets of banks. Some of them are related to income recognition, asset classification and provisioning, capital adequacy, investments portfolio and capital market exposures. RBI has issued its guidelines under the Basel II for risk management. Disclosure Norms: One of the important tools for marketing discipline is to maintain public disclosure of relevant information. As per RBI’s directives, the banks are required to make disclosures of their annual reports and some other documents about their capital adequacy, asset quality, liquidity, earnings aspects and penalties imposed on them by the regulator. Issuing of Anti-Money Laundering Norms: KYC norms ( Know Your Customer) Anti- Money Laundering (AML) and Combating Financing of Terrorism (CFT) guidelines are some of the major issues on which RBI keeps issuing its norms and guidelines. Protection of Small Depositors: RBI has set up the Deposit Insurance and Credit Guarantee Corporation (DICGC) to protect the interest of small depositors, in case of bank failure. The DICGC provides insurance cover to all eligible bank depositors up to Rs.1 lakh per depositor per bank. Para – banking Activities: Parabanking activities are those activities which don’t come under the traditional banking activities. Examples of such activities are asset management, mutual funds business, insurance business, merchant banking activities, factoring services, venture capital, card business, equity participation in venture funds and leasing. The RBI has permitted banks to under take these activities under the guidelines issued by it from time to time. Annual Onsite Inspection & Rating: RBI undertakes annual on-site inspection of banks to assess their financial health. Based on the findings of the inspection, banks are assigned supervisory ratings based on the CAMELS rating. Sensitivity i.e. particular risk exposures to specific industries. OSMOS: OSMOS refers to Off Site Surveillance and Monitoring System. The RBI requires banks to submit detailed and structured information periodically under OSMOS. Credit policy is part of monetary policy as it deals with how much and at what rate, credit is advanced by the banks. 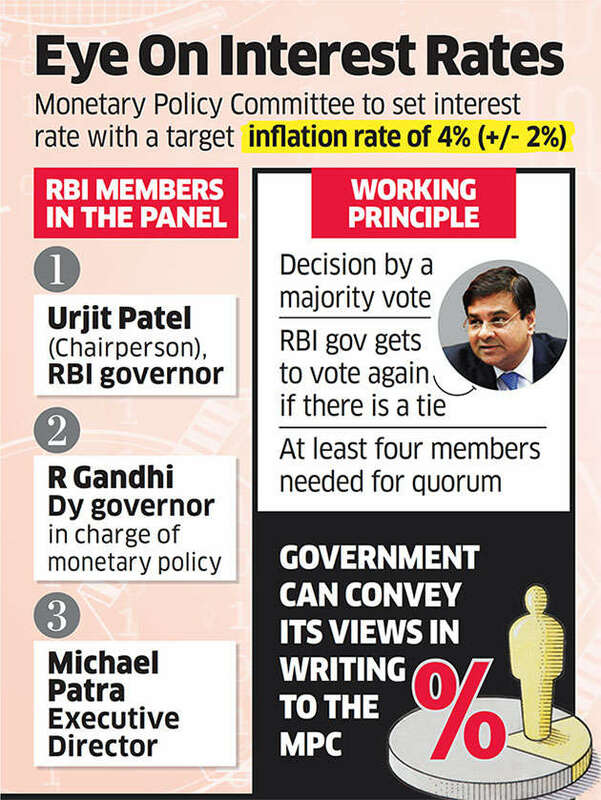 The amended RBI Act also provides for the inflation target to be set by the Government of India, in consultation with the Reserve Bank, once in every five years. Accordingly, the Central Government has notified in the Official Gazette 4 per cent Consumer Price Index (CPI) inflation as the target for the period from August 5, 2016 to March 31, 2021 with the upper tolerance limit of 6 per cent and the lower tolerance limit of 2 per cent. Statutory Liquidity Ratio (SLR): The share of NDTL that banks shall maintain in safe and liquid assets, such as, unencumbered government securities, cash and gold. Changes in SLR often influence the availability of resources in the banking system for lending to the private sector. This is the very good initiative as no one care for this optional. So if possible, cover dynamic & current affairs part of Paper 1 and 2. Thanks! We will try our best. Good initiative.. thanks for the info.